(AUSTIN) — Governor Greg Abbott and Lt. 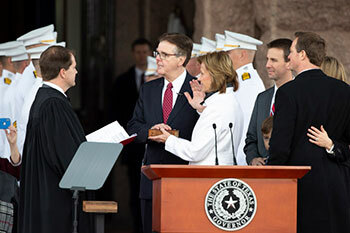 Governor Dan Patrick vowed that the state will deliver on a promise of education and property tax reform in their addresses to the crowd at the Inauguration Ceremony on the Capitol Grounds Tuesday. Cloudy and cold, the masses still turned out to hear Patrick and Abbott renew their oaths and lay out their plans for the future. 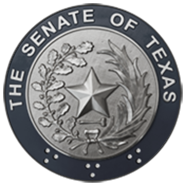 In his speech, Patrick focused on bipartisanship and praised the way the Texas Senate works across party lines to deliver good government to the people of the state. "In Texas we're different," he said. "We work together for the people of Texas because that's what you expect us to do. The elections are over….for right now, and for the next 140 days, you expect us to do the work of the people." Of the almost 1600 bills passed in the Senate last session, Patrick said, only 23 were passed strictly on party-line votes. 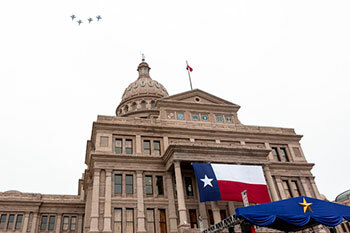 Fighter jets fly over the State Capitol to commemorate the Inauguration Ceremony for Gov. Greg Abbott and Lt. Gov. Dan Patrick on Tuesday. Fifth Circuit Court of Appeals Judge Don Willett administers the oath of office to Lt. Gov. Dan Patrick, marking the beginning of his second term. Next, Governor Greg Abbott took his second oath of office. Like Patrick, Abbott promised a sweeping reform package for property taxes and education finance. "I want to make this very clear," he said. "We're going to do this session what no one thinks we are capable of achieving. We are going to finally fix school finance in Texas." On property taxes, Abbott sees an "archaic system" where skyrocketing rates are pushing people out of their neighborhoods and keeping young people from purchasing houses. He listed three policy proposals to address this problem. First is a limit on property tax growth and the second is an end to unfunded mandates on local jurisdictions from the state level. Third, he wants to give citizens more control over the retention of property tax assessors. "Taxpayers should be given the power to fire their tax appraiser," he said.